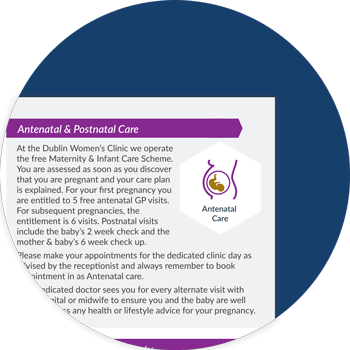 We deliver our Women’s Health Services to you by way of our Dublin Women’s Clinic. Our team of female doctors established this clinic some years ago www.dublinwomensclinic.ie. At the Dublin Women’s Clinic our experienced medical team offer a high quality, caring and confidential healthcare to meet your needs. We look after all aspects of women’s health such as contraception, infertility, pregnancy care, smears, STDs, women’s health screening and lots more. As experienced General Practitioners we also look after you when you need a doctor for a chest infection, back injury or any such acute or chronic concern. We offer same day appointments and have convenient extended opening hours to fit in with your busy lifestyle. Please visit www.dublinwomensclinic.ie for further information or scroll down to review the basic synopsis of what we offer.